The Halo Rover has 3 rider settings (beginner, intermediate, advanced) which controls the speed. These settings can be accessed and changed thanks to the Halo Rover app (included), so you can design your riding experience based how you want to ride. This board is UL2272 certified, meaning it has passed an endless array of severe electrical and safety tests. It will not explode (which is many peoples’ fear when it comes to self-balancing hoverboards), catch fire, or injure you in anyway when you’re riding – injuries happen because riders do not exercise caution and accidents happen. Now, on paper 9 mph (which is the Halo Rover’s top speed) may not seem very fast. Once you actually get on the board, however, the game changes. ~9 mph is fast for a hoverboard, and you will slip and fall cruising along at this “small” speed if you don’t know how to effectively balance on hoverboards. As with anything, however, the more you practice something, the more efficient you become at using it. Riding hoverboards is no different. When you want to monitor and change the Rover’s speed, distance traveled and power, you can hop on the hoverboard’s smartphone app and change any setting at any time as you see fit (you can even change the steering sensitivity), all from your smartphone. While this is standard practice in many hoverboards, it’s still an incredible feature to keep in mind and have. One drawback (which goes for almost every self-balancing scooter) is the fact that it doesn’t come with a “training course” DVD. To learn how to ride a scooter, there’s nothing you can do except actually ride it. This is what makes the learning curve so steep for riding hoverboards correctly (and safely). However, there are plenty of tutorial videos on YouTube that you can review before stepping on your first board. Although it would be nice if tutorial videos were included in the shipping package. Most hoverboards are for flat-surfaces only (such as the floors in your house or paved streets), which is fine for most people. These flat-surface-only boards make sense for beginners or riders out for a leisurely stroll. 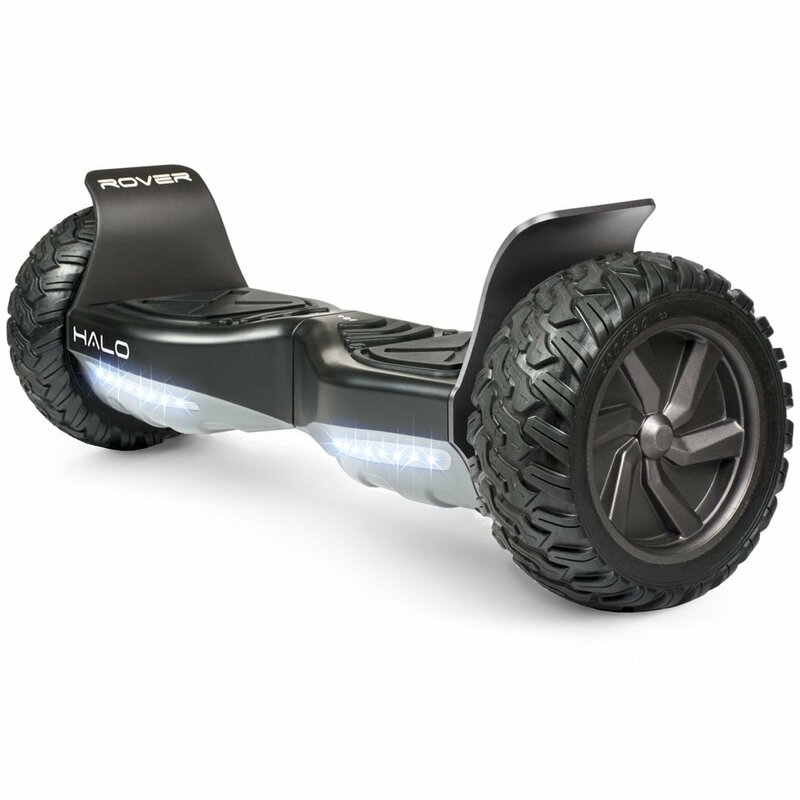 However, for “adventure seekers,” an all-terrain self-balancing scooter like the Halo Rover is MORE than ideal. It can travel through mud, slush, sand and even snow. A beautiful advantage the Halo Rover has over most other boards is the fact it travels up to 10 miles (~16 km) on one battery charge! It takes roughly 2.5 hours for the battery to fully charge. While it may seem like a lengthy charge time, keep in mind that being able to travel 10 miles on one charge is no small feat. The weight isn’t a carrying issue, however, since the package comes with its own carrying case to make travel faster, easier, and less heavy. Just keep in mind how heavy this thing is when you’re buying, as most people (myself included) have trouble lifting just thirty pounds for any length of time. But… and this is a big but… the casing around the foot pads is not covered under warranty. Which is silly, considering the casings are the most vulnerable parts on the board! They’re constantly susceptible to foot damage – and are made of cheap plastic. Major drawback here. One user, whose foot pad casings cracked, reportedly had to shell out $150 (from his own pocket) to have them replaced. Be aware of this if you’re purchasing the Halo Rover. That cost, however, is not for the faint of heart: $599-$600. At this price it is a serious investment into happiness and the amount you’re willing to pay to get more out of life. Part of the reason the Halo Rover is so expensive is due to its off-road capabilities. Most “street version” boards’ less-expensive price tags (such as the Sagaplay F1 – ~$380-400) is because they are for flat, paved surfaces. By design, the Halo Rover is designed to endure snow, sand and uneven surfaces, hence the hefty price tag. I cant keep up so I keep it in Intermediate mode, which is faster than a walk, but slower than a run. I mean 10 mph, thats fast when you actually get going. So far, I love it, the speaker is a cool option, however Id liken it to my 1970’s style AM/FM radio speaker. Yes it sounds perfectly fine, but its not STEREO-if it is then its not that great, which is what almost everything is these days. However, if I had to do it all over again, I think I would just get the normal street versions. The off road just adds to the possibility of an emergency room trip.